Monchique is a small market town situated uphill, 84Km from Faro and around 900m above sea level between the two highest hills in the Algarve, Fóia (also known as Serra de Monchique with 902m) and Picota (the 2nd tallest with 774m). Monchique it's also known as the "Algarve Garden" because its subtropical and humid climate, which allows the growth of unique types of vegetation, such as the exotic and rare Carvalho de Monchique, a unique type of Oak tree that only grows in these hills. 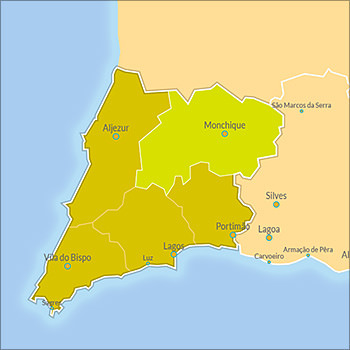 The council is divided in 3 main Parishes, Alferce, Marmelete and Monchique. Basketry and weaving are a major part of the traditional Monchique handcrafts. Because it's also a region rich in oaks, it's possible that there are also artisans working cork. The Thermal Springs of Monchique are known by its hot sulfur springs that usually are sought for treatment of rheumatism and respiratory illnesses.